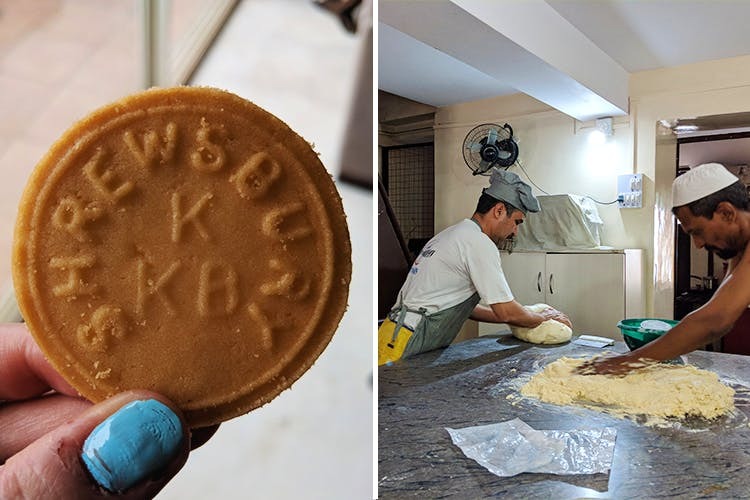 Khodayar Bakery (aka Khodayar Kayani Bakery) is a small, boutique bakery that makes the most divine biscuits and tea-cakes. Cousins of the famous Kayani Bros. on East Street, we think that the baked goods at Khodayar Bakery are far superior in both quality and taste. Khodayar Bakery was started in 2001 by Danesh Khodayar at Sharbatwala Chowk in Camp (opposite Cafe Yezdan). Danesh had been trained in the bakery arts since the mid-80s, and was a partner at Kayani Bakery until the ’95, before he went to England to pursue a career in cricket. After a couple of rough sporting-related injuries that kept him out of the game, he returned to Pune and decided to open his own bakery – thereby continuing the family legacy. His source of inspiration comes from his grandfather, who (he tells us) always said, “knowledge always has to be parted with”; a noble sentiment that Danesh embodies through his staff of expert bakers. Khodayar Bakery recently shifted to a new location near Golibar Maidan – Minoo Manzil – which can be mapped on Google. Their inconspicuous shopfront barely hints at the quirky charm that lies within – displayed in the form of hand-written notices, posters, old wooden cupboards, a hand-painted menu board, an ad for a Parsi tiffin service, family photos, and a framed picture of Zarathustra (the Zoroastrian prophet). We were allowed inside their bakery workshop, which is as well-organised and clean as can be expected. Everything on the menu is baked super fresh to-order, and you can certainly tell by the taste. Their oh-so-buttery biscuits just melt on your tongue – and we recommend you order their Shrewsbury (INR 360/kg), ‘maska-butter’ batasis (INR 320/kg), savoury cheese papri (INR 320/kg), khari biscuits (INR 280/kg), Brazil-nut biscuits (INR 440/kg), and mawa cakes (INR 20 for large, INR 10 for small). They also make jira toast, sweet rusk toast, sugarless ginger/wheat biscuits, butterscotch/chocolate chip walnut biscuits, plain cakes, fruitcakes, choco-chip walnut and rich plum cakes, wholewheat cupcakes, and hot cross buns (only at Easter time). Khodayar Bakery doesn’t keep a lot of stuff for sale other than what’s pre-ordered, and they don’t retail their biscuits or cakes elsewhere. You can place your order up to 2 days before (for large orders, we recommend 3-4 days prior) by texting/calling them. Indulge In Mawa Cake And Shrewsbury Biscuits At Kayani Bakery!